A great tasting dish that’s really easy to make in less than 30 minutes! 1. Prepare the zucchini/courgettes by slicing off the tops and bottoms. Wash well and slice. You want them to have a medium thickness (as in the image above). 2. Slice the onion finely and fry in hot oil. 3. As the onion starts to brown a little, add a pinch of fresh cumin seeds. Fry for 30 seconds. 4. Lower the heat and add the spices (salt, coriander and turmeric) and fry for 1 minute. Add 1/2 cup of water to form a bit of a paste. 5. 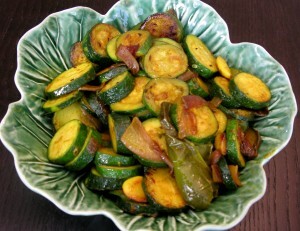 Add the zucchini/courgettes and stir well. Pan fry for 10-12 minutes until cooked on medium to low heat. (Add 1/4 cup water if needed). Make sure the vegetables remain a little crunchy rather than mushy. Recommendations: Enjoy with brown or white basmati rice and a side of lentil curry.